Wireless charging uses electromagnetic field for the transfer of energy between two objects. The similar technology is implemented in the wireless car charging to charge electric vehicles effortlessly. A report offered by Persistence Market Research delivers key insights on global wireless car charging market over the forecast period (2017-2025). The report highlights value chain and market dynamics across five key regions influencing growth of the market throughout the forecast period. The study further delivers detailed dynamics of the market on the basis of various segments. The assessment period has been engaged to develop accurate estimations related to market sizes throughout the forecast period. A team experts, trade analysts and research consultant from electronics and smart devices sector have complied this comprehensive study. Qualitative data on market trends and dynamics of market have been permeated with quantitative information to generate exact market size projections. Further, detailed analysis of each segment has been provided in terms of market size, revenues and values. Moreover, market players can also develop new strategies and product development as well as can change present stratagems to move vigorously towards future market direction by availing this report. 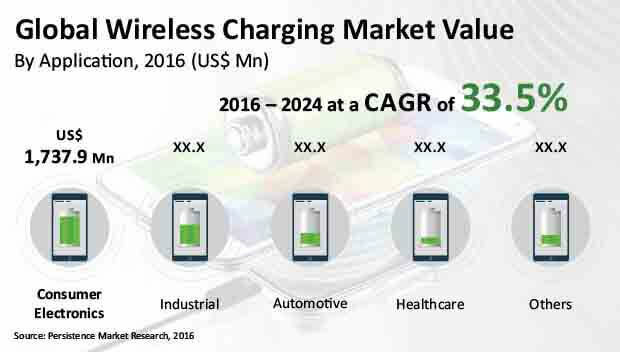 The report offers detailed information in terms of quality and quantity of each segments of the wireless charging market as well as drivers, trends and various charging technologies that are developed and are being adopted by consumers. The report also includes the market strategies of the leading market players and major sectors that have been using this technology and are fueling growth of the market. Sectors that have huge demand as well as the regions demanding wireless charging technology have also been included in the report. The report even serves as reliable source of information for the market players. In addition, market growth and possibilities of expansion among various regions have also been discussed in the report. Report further reveals detailed information regarding the dynamics of market on the basis of various segments. In this report, the market has been segmented on the basis of component type, application type, technology type and by region. The study reveals that the market on the basis of component has been segmented into receivers and transmitters. By the technology type, the market includes resonance charging, inductive technology and radio frequency technology segments. Additionally, sub segments of the market based on applications are automotive, industrial, consumer electronics and healthcare. Further, report provides dynamics of the market in various regions. Europe, North America, Middle East & Africa, Asia Pacific and Latin America are key regions that are profiled in the report. The report offers key trends in particular countries that are responsible for the market growth. The report evaluates recent and future scenario of the market in particular region as well as for specific segment too. The report considered economy-wise charging production and wireless charging sales, electronic devices across regions and adoption rate of these devices. This report not only offers estimated forecast on the basis of CAGR but has also analyzed various parameters such as year-on-year growth to estimate market size and to find out right opportunities across market. As per aforementioned, the market has been segmented into various segments. All the segments on the basis of different regions are analyzed contribution of each segment in growth of the market in terms of basis point share. Such detailed information is necessary to identify different key trends leading global wireless charging market. Another major attraction of this report is the analysis of all the key segments based on absolute dollar opportunity. These factors are traditionally overlooked while generating projections of the market. Consumer electronics segment accounts for comparatively higher revenue share in the global wireless charging market and is expected to remain dominant throughout the forecast period. Leading wireless charging solution providers are offering wireless charging solutions for consumer electronic devices. Also, wireless charging solution providers are entering into partnerships with consumers electronic devices manufacturers to develop wireless charging enabled devices. This segment is projected to be the most attractive segment in the global wireless charging market during the forecast period. Consumer electronics segment was valued at a little more than US$ 1,000 Mn in 2015 and is expected to remain dominant throughout the forecast period, accounting for a revenue share of more than 50% by 2024 end. Demand for wireless charging is witnessing significant increase owing to rising consumer awareness as more number of mobile devices are being launched with embedded wireless charging technology. Technological advancements in mobile devices such as embedded wireless charging technology are creating awareness about wireless charging among consumers. An increasing number of mobile device vendors are incorporating the wireless charging feature in high end models of smartphones, wearable devices, laptops, and notebooks, which is driving adoption of this technology. As a result, the consumer electronics segment is showing robust growth in the global wireless charging market. Wireless chargers enable charging of multiple devices at the same time. These devices can be free positioned, which means there is no particular way a device should be placed or positioned for charging. However, it needs to be kept within a particular range or proximity of the wireless charger. This free positioning feature is enabled by resonant technology. This particular factor is creating a positive impact on the consumer electronics segment. Demand for electronics is rising amongst the consumers globally; particularly there is great demand for mobile phones across the globe. Specifically, Asia Pacific represents a vast potential in terms of growth for the global wireless charging market due to the presence of a large population and wider adoption of mobile devices such as smartphones and wearable devices. Companies in China, Japan, and South Korea are investing significantly in wireless charging technology for consumer electronics, thus driving the growth of this segment particularly in the APAC region. Increasing proliferation of the Internet of Things (IoT) is further boosting the growth of the consumer electronics segment. Growing adoption of the Internet of Things is driving the need for constant power supply for electronic devices connected to the IoT network. As electric charging methods are complicated and are sometimes not compatible with IoT devices, wireless charging is a convenient method to power an IoT network. In terms of revenue, the consumer electronics segment is projected to be the most attractive segment in the North America wireless charging market during the forecast period. The segment accounted for a relatively high revenue share and was valued at more than US$ 400 Mn in 2015. The consumer electronics segment is expected to remain dominant in the North America wireless charging market during the forecast period. In Latin America, this segment was valued at more than US$ 70 Mn in 2015. In APAC, the consumer electronics segment accounted for a relatively high revenue share and was valued at more than US$ 350 Mn in 2015. Powermat Technologies Integrated Device Technology Inc.
Energizer Holding, Inc. Leggett and Platt Inc.